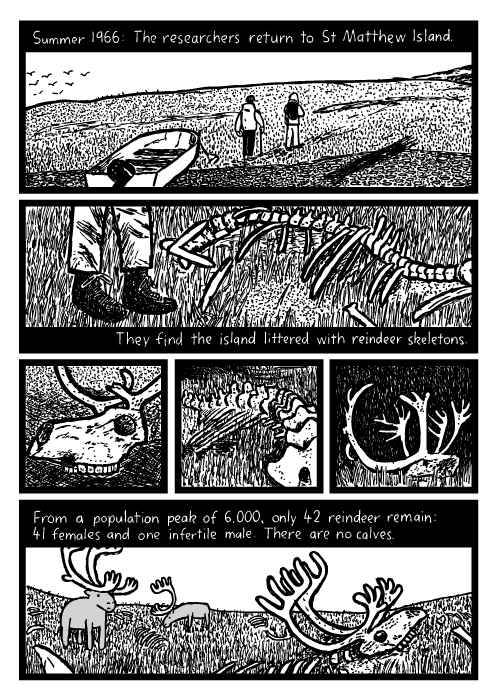 Read some reflections and insights into the St Matthew Island comic and the true story of the reindeer population crash in the blog section of this website. 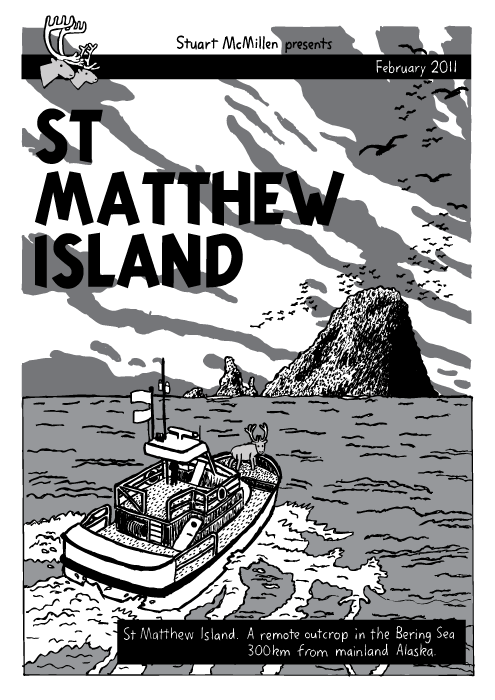 This is a reflective essay about my comic St Matthew Island, which is one of the most popular items on this website. 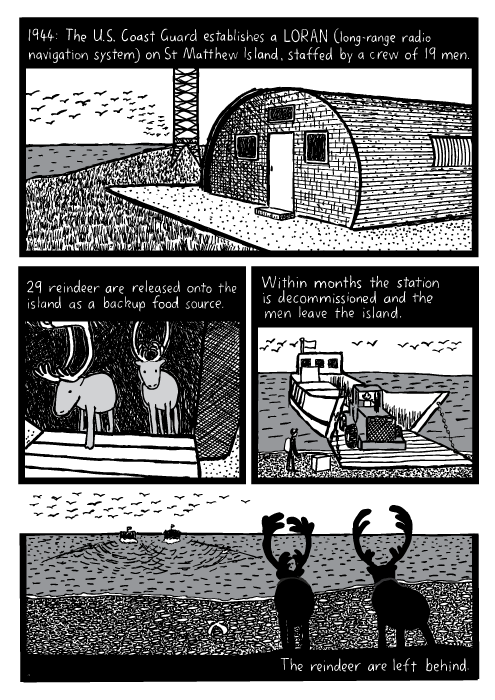 This essay describes my research process, including the real life story of St Matthew Island's reindeer. Really interesting because you concisely review areas many have never heard of and make sustainability and environmental issues relevant. Thank you and keep it up! Wow, that was so good. You're so talented! What about Klein? He did research to see what happened to the reindeer. Now you need to distribute this so that it goes to colleges, universities and high schools. E. O. Wilson told me years ago that education is one of the best ways to offset. Transposing from deer to humans, humans (tool users) main food would be cheap fossil oil that runs our machines, when that runs out there will be trouble. The sun will always shine on the planet and as long as the miracle of photosynthesis works, there will be food. Just when we thought comics were dead... 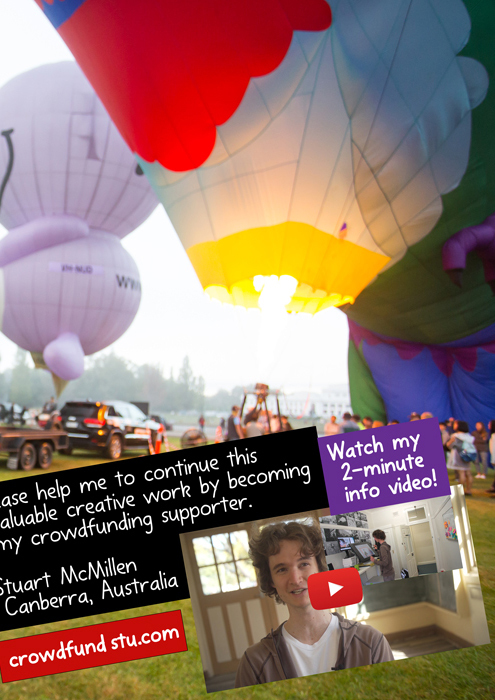 Thank you Stuart McMillen. Thank you for the nail-biting, stay-up-all-night and nerve-tingling suspense. An impressive Comic of suspense and dark horror! Great and impotant work. Thanks. Is it just me or is the title page inspired from Tintin's album "the black island"? The wold have needed a wolf! A great story I knew nothing about. Just to the right of your Post Comment button you should have a Sign me up for the newsletter only button. That totally surprised me so much! 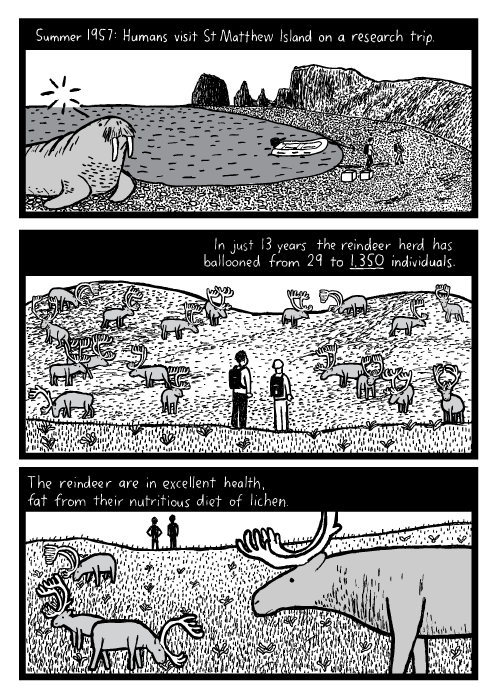 Well done, interesting, but I think the humanity got more adaptation ability than deers, and will achieve to survive (but its environment will be severly downgraded, no contest). I really like this comic and you should make many more!! P.S. I wish our school had these type of stories!! - Thus reindeers teach: make love not kids. Isn't it? - Not really. These stupid animals did not even invent war. I'd say that the most interesting thing about the whole story is how fast the population decline happened. In '63, during their population peak, the talk of town among the reindeer might have been something like: "Hmm, food is getting a bit scarce. Might be we can't grow or population more. Perhaps it's even going to have to shrink. A little bit. Over the next ten years or so." They probably had no clue whatsoever that they were just two years away from a rapid population decline 0f 99.3%. 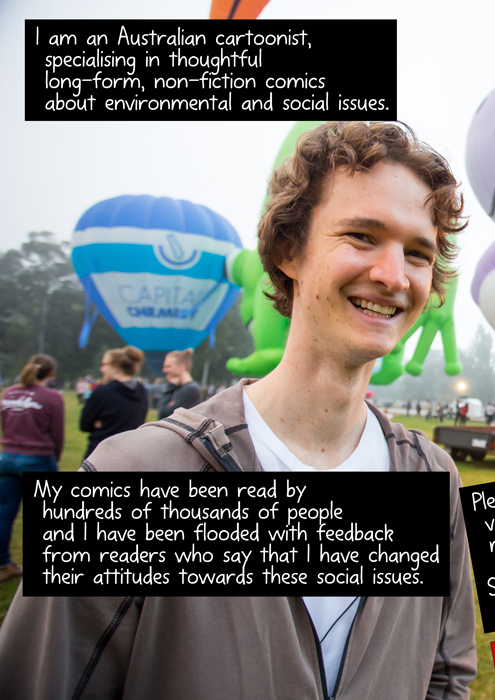 Makes me go "hmmm..."
you're doing good.I love it maybe you can put color on your comic. Wow, it's really shocking. Because, they only started off with 29 Reindeer, first the population skyrocketed for 13 years. 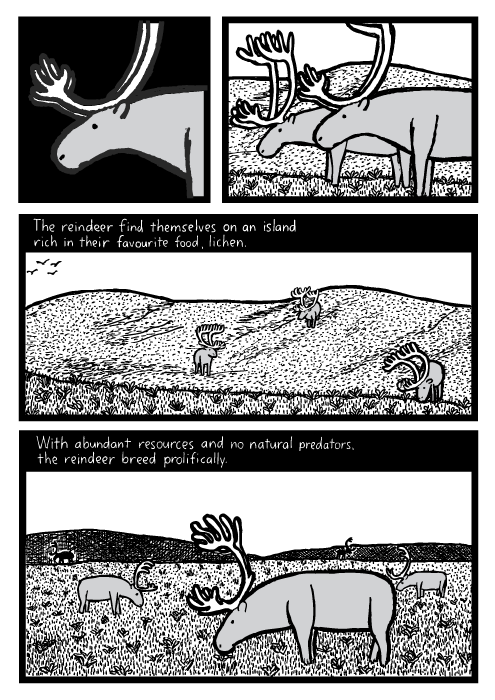 --Now, since the food source was scarce, all the reindeer started to die off. I'm not shocked to say that this could happen to another population as well. The amount of time it took them to die was crazy. it is so impressive! reindeer failed to explore outer space before too late, they died off. I personally think that the best example is the one of Easter Island. Many can argument that the collapse of St Matthew happened because they were just raindeers, not as "smart" as humans, but we see we are heading the same direction and still waste resources without taking any responsability. Freedom is yours as long as you don't disturb the others freedom. what are we doing with the freedom of those who will live after us?. sorry if any error, english is not my mother tongue. Nice comic by the way!! I enjoyed this comic, could be very true and realistic to our generation today. 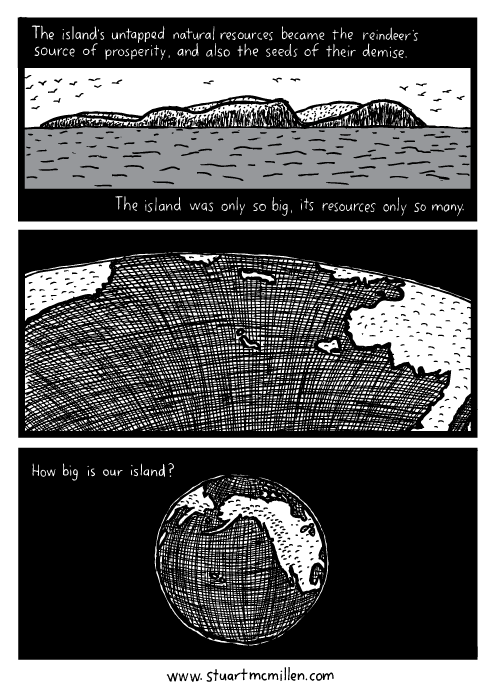 Hopefully we'll stop over consuming before it's too late like the comic, in a way. 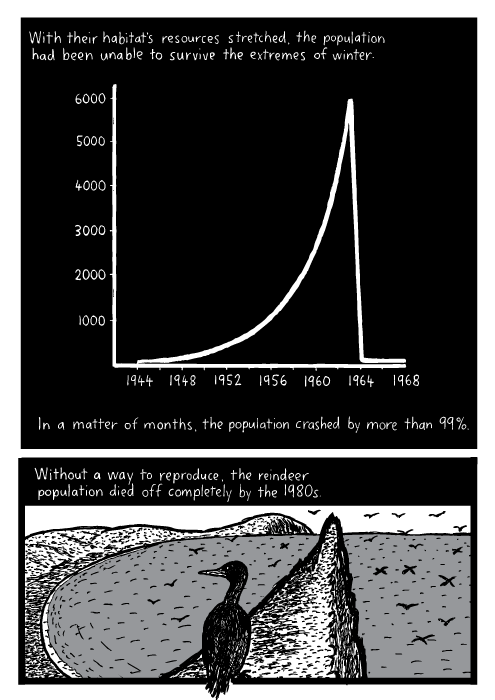 Very similar to the "tragedy of the commons" story. Well done! It is in fact not quite, but exactly Malthusian. It is a compact, real-life example of Malthus proposition. I recommend, for examples involving human beings, reading Jared Diamond's excellent book "Collapse", in which he describes in detail the collapse and extinction of a number of human communities due to exhaustion of ecological resources. Though Victorian predictions of the end of civilization due to the accumulation of horse dung and the group of Rome's "Limits to Growth" have been falsified by human invention, we are genuinely looking at the end of some resources that are crucial to the current form of technological civilization. 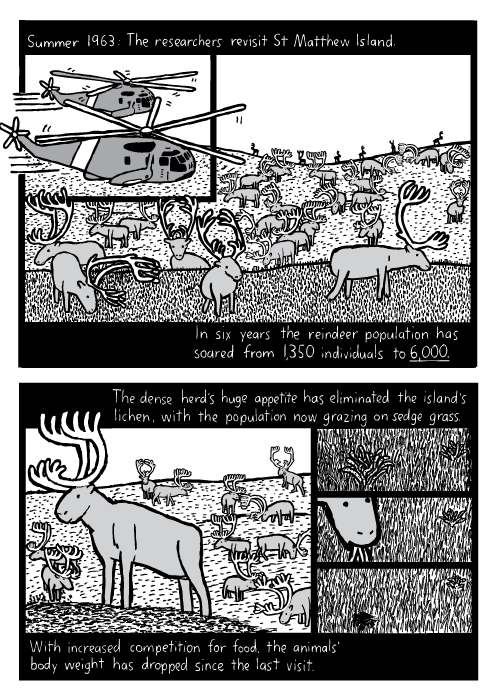 In fact the mere prospect of a shortage can be disastrous: as Diamond demonstrates in his book, humans, unlike reindeer, will fight ruthlessly for diminishing resources, causing chaos and accelerating the demise of society. Beware of the exponential function: it is at play in any situation of population growth and it can easily outstrip countermeasures that are merely linear. If it's scary and you'd rather not think about it, then it's Malthusian. What we have to realize is that we are animals and our animal instincts drive us to breed, consume and fight. All the amazing technology that we've developed is driving us faster and faster towards a precipitous population crash. It is not slowing, nor can it prevent the final demise of our civilization. The signs are all there. You just have to open your eyes. Nonoli1998 is right but I would add one more factor: overpopulation. The time for being fruitful and multiply is gone. We have to start worrying more about the quality of the human race than its quantity. A very apt, and unique, analogy - the one about Easter Island has been done to death, but the message of both ecosystems can be found in innumerable examples.... but it's a message that our current global civilization has failed to take heed of in any effective way, and the consequences for us will be the same, albeit slower as our 'island' is a lot bigger... good work Stuart! it is so impressive! reindeer failed to explore outer space before too late, they died off. think about our human back in the cold war, human beings were exploring outer space in so uneconomic ways, they were so proud for their ideologies therefore they have done "stupid" things to prove. nowadays, we are much smarter, profit comes first. sustainable development relies on environmental protection. I like to quote a word from my most favor sci-fiction writer "we are like an infant trying to fix our cradle"